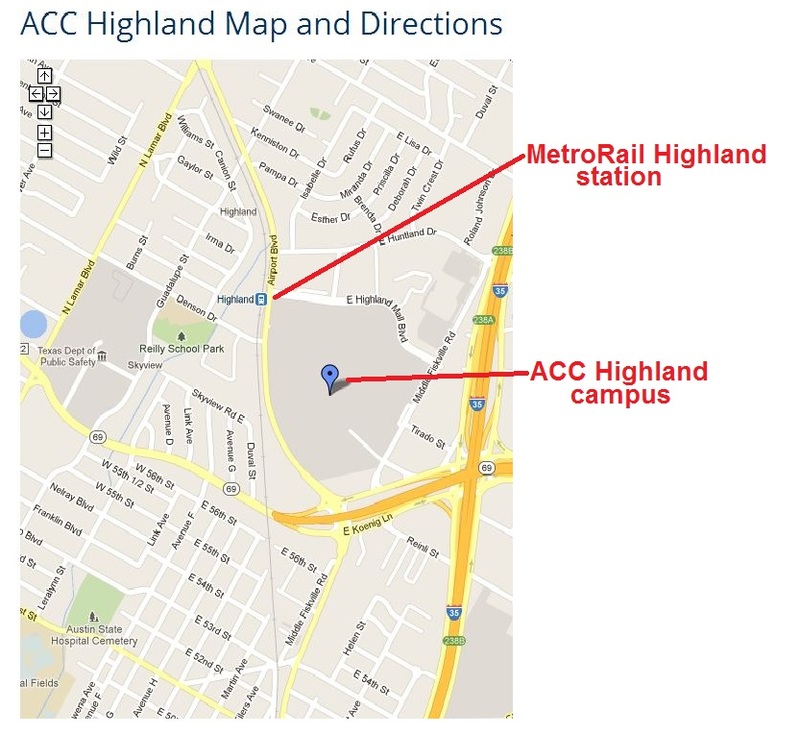 ACC’s map from its own website (annotated by Austin Rail Now) shows ACC campus (marked with inverted blue “teardrop”) with MetroRail’s Highland station at its northwest corner. The following commentary has been slightly adapted from an original Letter to the Editor published July 21st by the Austin Chronicle. 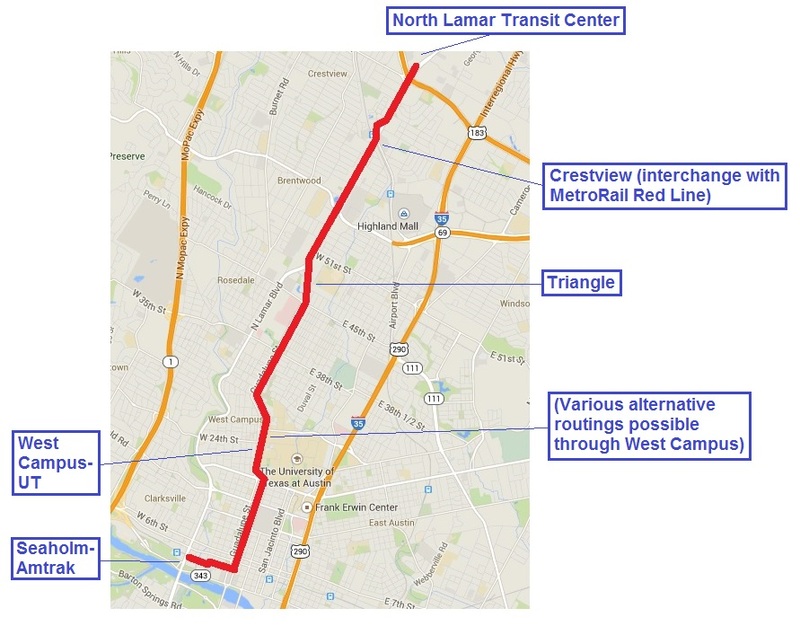 On June 26th, the City Council endorsed Project Connect’s urban rail line route. Public testimony was limited, but I would have pointed out three incontrovertible facts. (1) The first is that the approved route terminates at the old Highland Mall, with no plans to extend any further. Every initial line, as part of any transit system, should have plans to be extended, but this one isn’t. 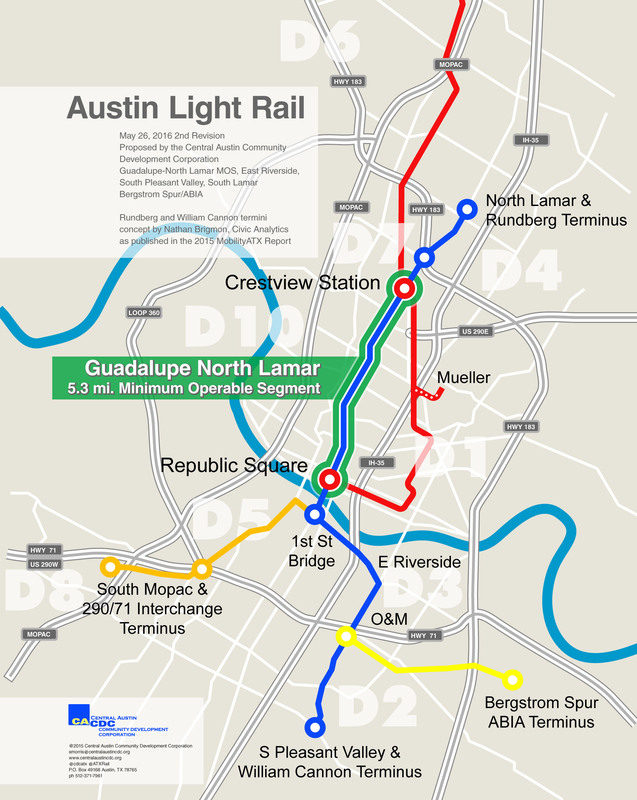 Terminating Austin’s initial urban rail line there is proven illogical by no plans to extend it. (2) And doubly illogical because, second, the entire proposed redevelopment is already served by passenger rail. As shown in ACC’s own map at the top of this post (with annotations by ARN), the Highland station on the MetroRail Red Line is within a half-mile of the entire Highland Mall site – the distance passengers are willing to walk in a transit trip. Spending hundreds of millions of dollars on a tunnel, and placing new rail on Airport Boulevard (paralleling, only a few feet away, the already existing Red Line passenger rail) to reach a planned redevelopment already served by voter-approved (and funded) passenger rail is a very expensive double service. 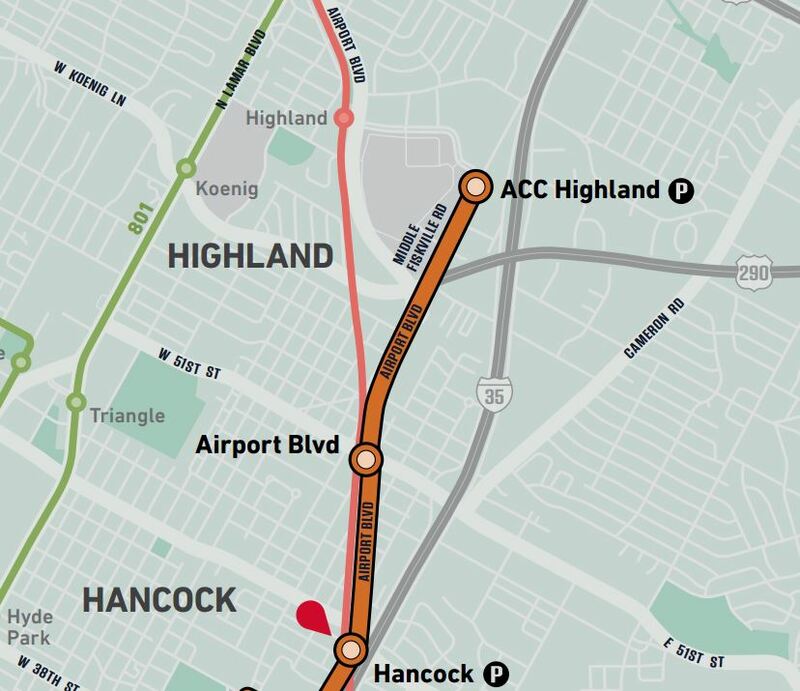 Closeup of Highland ACC segment of Project Connect’s proposed urban rail map shows how the proposed urban rail line (orange) would effectively duplicate the existing MetroRail Red Line paralleling Airport Blvd. (MetroRail drawn as red line, with Highland station shown as red dot near top of map). Project Connect line would terminate at ACC administration building on far east side of campus, with no plans for extension, and no available corridor for extension. Map: Screenshot by ARN, from Project Connect map. (3) Third, the projected ridership for the Guadalupe/North Lamar light rail route, considered by voters in 2000, was twice what is proposed now. Higher ridership indicates overall success of a rail line, which means federal funding is more likely, with a likelihood of more voter support of the next urban rail line. Guadalupe and North Lamar is where millions of dollars were spent, in 1999-2000, in an already approved federal study determining where rail should be. 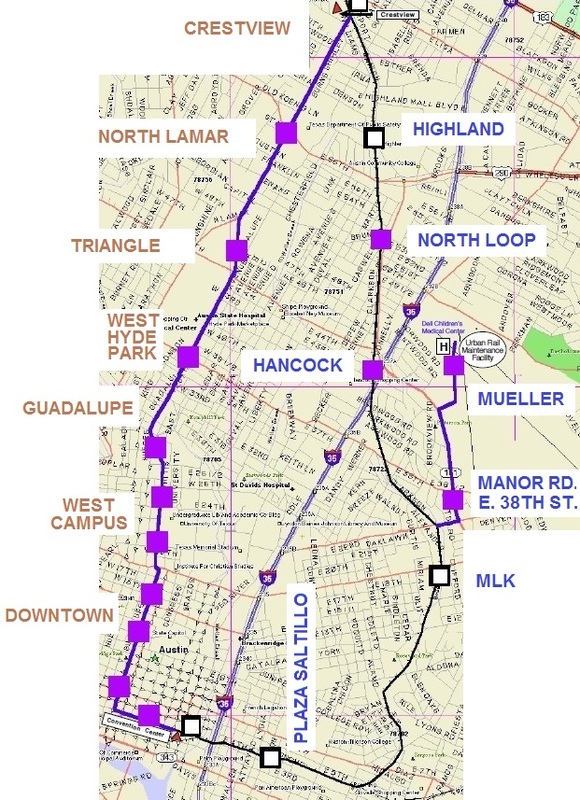 Screenshot from Federal Transit Administration’s New Start summary table of Capital Metro’s 2000 Guadalupe-Lamar urban rail (light rail transit) plan. 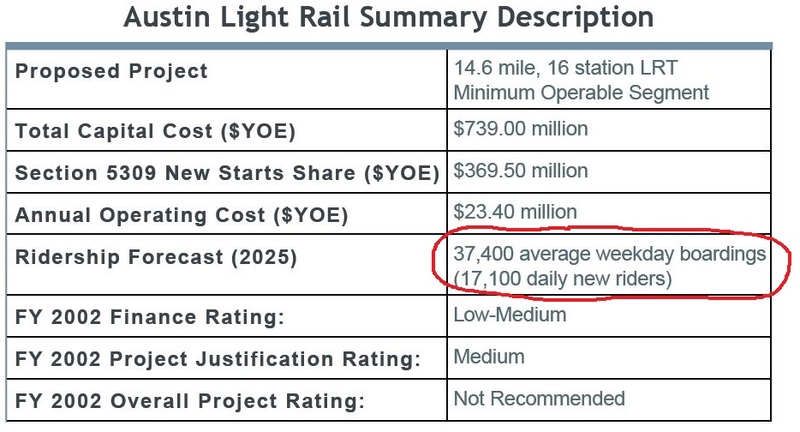 Projected daily ridership (circled in red) of 37,400 is more than double the 18,000 Project Connect claims for its current Highland-Riverside proposal — and more than triple a more realistic figure of 12,000. Annotation: ARN. You are currently browsing the archives for the Andrew Clements’s postings category.